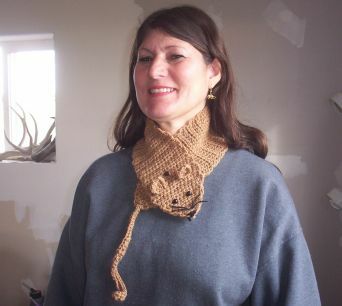 The scarf has been hand crocheted stitch by stitch. It is approx. 32" long with an approx 7 3/4" tail and is about 4 1/4" wide. The rat is Pink with Red pony bead eyes and Red yarn for the nose and whiskers. The ears stand out. The one I am wearing is *mine*. I have not worn any of the sales items. 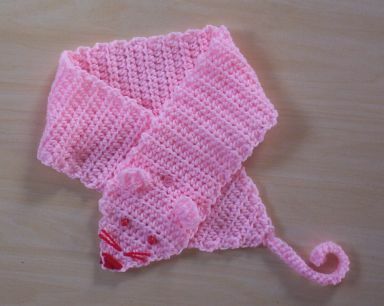 I also have a scarves in different colors on The Agile Rat site. Yes, I sell the same type earrings I am wearing in the photo here on our site too. Take a look.